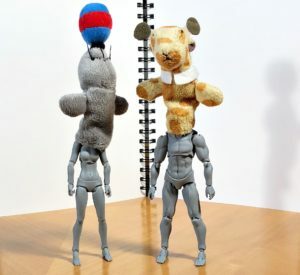 The case of the fake Body-Kun (FBK) figures has been resolved! Sort of. I ended up having to ship them back at my expense for twice the cost of the original shipping. I didn’t like it, but I’ll get most of my money back. Perhaps I can (begrudgingly) justify it as the cost of a lesson learned… HOWEVER, being the glutton for punishment that I am, I ordered another set of figures! It’s okay this time, really! 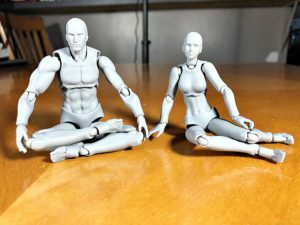 They are authentic Figma Archetype figures and they are SO much better! Archetype:He and Archetype:She just chillin out! Even more fun was playing with the figures afterward! The Figmas were less expensive than the FBKs, but they also came with zero accessories and not as many extra hands. That was not a dealbreaker at all since I’d rather have a few pieces that are high quality than a bunch of low quality junk. It does mean that I’ll have to be creative in finding props for the Figmas, so the first place I looked was my kid’s toy box! There was a Power Ranger sword and a gun from one of the action figures in the action figure bin. Sadly, both were too big for the figures’ tiny hands. What more than made up for that was the slightly forgotten dinosaur set hiding under the bed! There were rocks, trees, and dinos of all sizes. I grabbed a couple of tanks, a monster truck, and some finger puppets – all in the name of seeing how good these figures really are! The dino scene came first. 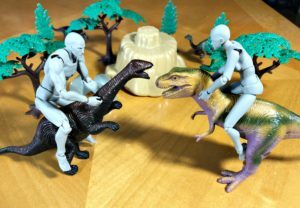 The dinos on hand were too small for the figures, but the point was really to see if they would sit on the dinos without any help. They definitely did and I even got them to look half-way passable as a reference. That is, if you like giants on dinosaurs. Or people on tiny dinosaurs. Before taking it all down I put the Archetype:She on a monster truck and sent it at the Archetype:He still on a dinosaur. She didn’t stay on, but it was still fun! She even stayed in the position I put her in. After this it was time to put them on tanks! It took several tries to get the tanks to hit each other, but with every attempt the figures stayed perched on top – at least until the collision! I can also confirm that they will stand up on their own and can even handle a little extra something. They’re wearing finger puppets almost as big as they are! I swear, I WILL use them for drawing references. I’m also going to hit the dollar store and see if there’s anything floating around there that might make a good prop. If you have an idea or something you want me to try, let me know! Things with PayPal and the fake Body Kun dispute did not end well. Not only did Canada Post lose my package, but it couldn’t be located and I didn’t insure it. Doh! Since I couldn’t prove to PayPal that the fake Body Kun company received the item (even I though I showed that it shipped), they ruled that I couldn’t get a refund. So I’m out the cost of the figures, the cost of sending them back, and I don’t even have crappy Body Kun knock offs to keep making fun of. You should buying body chan body kun figure at Amazon.com.